A local authority has made more than £440,000 from the sale of artworks which critics say will be "lost to the public forever". Hertfordshire County Council is selling items from its collection which it said had "little relevance to the county". The first 152 pieces, including works by John Tunnard, Edward Wadsworth and Barbara Hepworth, were sold earlier. Opponents of the sale wanted the "significant body of art" put in a trust. The council began to acquire the paintings in 1949 as part of the School Loan Collection, an initiative where schools could borrow art to give pupils access to contemporary works. The service was discontinued in 2017, at which point the authority had 1,828 works valued at £26.2m. The Conservative-run council said it wanted to get rid of 90% of the collection because it was at risk of deterioration and there was a lack of resources to manage the artwork properly. 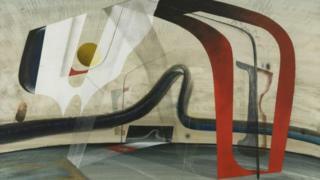 John Tunnard's Brandis proved to be the biggest draw on the first day of auctions, selling for £37,000. A pastel by Joan Eardley sold for £31,000, as did Anne Redpath's Blue Plate. A 20% buyer's premium will be added to the hammer prices. Conservative councillor Terry Douris said the decision to dispose of much of the collection was "the sensible thing to do" as 60% of it was "languishing in storage and not available to the public". A petition to stop the sale asked the council to seek alternative funding options and place the collection in a trust for the benefit of future generations. The petition founder, who asked not to be named, said: "A significant body of art, most of it bought with public funds and including many works by celebrated modern British artists, will disappear into private hands and be lost to the public forever." Some 112 works have also been accepted as gifts by Hertfordshire organisations, with more than 1,000 works still to be offered. Two further auctions will be held in April and May and the money raised by the council will be used to conserve its remaining 167 pieces. Those which will remain include four Henry Moore and Barbara Hepworth sculptures which alone are insured for £21.85m.